Will aluminum blanks be rust while using? As we all know that the iron products will be rust while using for a long time, then will aluminum blanks be rust in the same condition? As a professional aluminum circle manufacturer, we Haomei aluminum can tell you that aluminum discs will not rust. Because the chemical reaction is different, aluminum will only oxidized rather than rust, that is why aluminum circle have so many application than other round plate metals. 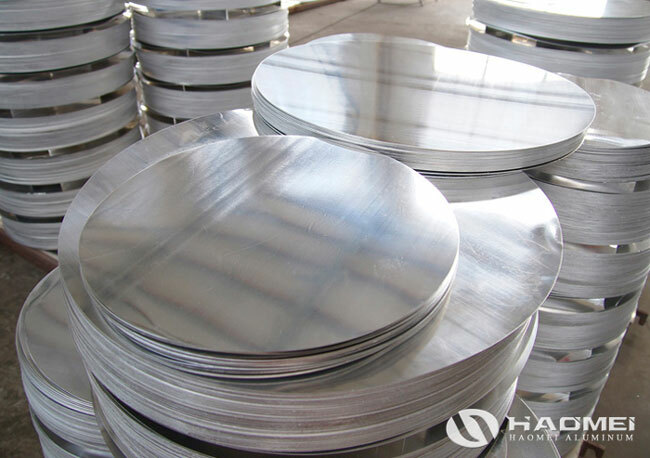 It is understood that in the processing of aluminum discs, the aluminum material which will be added other anti-rust and anti-corrosion metal elements like manganese alloy, manganese alloy so the produced aluminum blanks product has rust-proof effect. The aluminum cookware we usually use aluminum is made of aluminum blanks, the surface has a thin oxide film, only 0.00001 mm thickness, it can protect the inside aluminum from rust, this protective film is called alumina. In the industry, in order to make aluminum circle more durable, the factory will processing the aluminum circle products again, so that the oxide film is more thick, then the aluminum cookware can be used for longer period, but at the same time, it can not be used with acid and alkali. In the daily life, we can often see some people think that the aluminum pot is not bright enough, then rub with steel balls or sand when cleaning, they think it will make aluminum products become shiny, in fact, this approach is wrong, because it is easy to erase surface oxidized film. But when the oxidized film has been erased, a new layer of aluminum oxide will be generated to continue to protect the internal aluminum any more. In order to keep aluminum circle products from rust, the oxidized film should be protected.